What’s the great red wine? One of the most frequent questions that are often asked of any wine expert is What’s the great red wine? Naturally, there is no definitive answer to this question because, whether it is red wine or anything else that depends on taste, several factors intervene and, mainly, one’s subjectivity. In any case, certain standards allow you to evaluate the great exponents in the wine market, and it is according to these that you are now going to raise some considerations of specialists, who try to answer the question of which is the great red wine. They are made from different varieties of red grapes that through their skin will give the wine its color and provide compounds called tannins, essential in the composition of the wine and that give it its particular texture. The tannins are those that give the wine its firmness, that persistent quality in the mouth when it is drunk, and when the wine is younger, the greater is its firmness. As the wine ages, the firmness of the tannins softens, giving rise to the development of other more complex characteristics in the flavor of the wine. From here comes the notion that is already part of popular knowledge that red wine improves with age. Before, the “discard” wines were used to prepare some dishes. 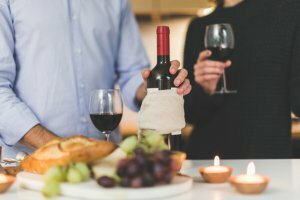 Today, chefs have a slightly more open philosophy “if you do not drink it, do not use it.” It tries to prevail the quality of the food, combining them with the best possible wine. The oldest of the family always recommend drinking a small glass of wine before going to sleep. This is the best antidote against any heart problem that can happen. In this case, a Cabernet Sauvignon, Petite Syrah or Pinot Noir is recommended. In a restaurant of half level, the wines have their separate letter. Several stores have their reservation that offers diners an interesting variety. But the choice of the best wine cannot be arbitrary. First, you must find out what food you are going to order, to know what the possible companions may be. As a next step, look how much money you intend to invest. Do not be afraid to ask for help from waiters or sommeliers.